Online casino and sportsbetting brand GR88.com has launched a new series of promotions that will be tied directly to the world’s craziest events. First up in the series is Vladimir Putin’s quest to rebuild the Soviet Empire. GR88.com has just launched PutinBet.com where it offers to donate 25% of the proceeds from certain slot games to the EuroMaidan Charity in Kyiv. 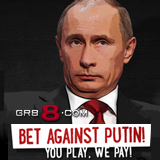 GR88.com invites everyone to visit http://www.putinbet.com and "bet against Putin to support the good people of the Ukraine."